At least nine workers have died in the collapse of a construction site on the Shanghai-Nanjing railway in eastern China, state media say. Four railway workers are still missing in the accident, which occurred in early morning in Jiangsu province, Xinhua news agency says. Initial reports suggested a gas explosion at a workers' dormitory had caused the collapse. 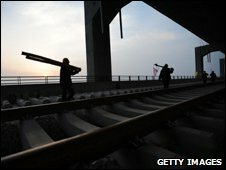 China has ambitious railway plans but a poor safety record for workers. China plans to build more than 12,000km (7,500 miles) of high-speed railway to connect its major cities. New links in China's railway construction programme are part of the economic stimulus plan announced in November. It recently approved a further two-trillion-yuan ($300b, £218b) investment plan for its railway infrastructure over the next two years. It also plans a high-speed network, starting with a line between Beijing and Shanghai. Chinese-designed trains on this route will be capable of speeds up to 380km/h (236mph).